PHOTO CAPTIONS: 1. Andre in uniform before his soccer match, 2. posing with a redwood tree in Big Basin State Park, 3. chatting on his cell in Capitola-By-The-Sea. Well, let's see. We did our prenuptial agreement in English and Spanish with two lawyers and notarized signatures...we got the wedding bands (mine's temporary until I find and repair my grandma Leslie's platinum band of tiny diamonds)...we have all the clothing except Andre still needs a belt...my neighbor Donna offered flowers from her garden...we have Gabriel and Debbie as witnesses, Gabriel will also photograph, and Lety and Moy will be our padrinos, whatever that means. Maya's former nanny Aracely said we had to have padrinos or else the marriage would fail. Even Lety wasn't sure, but I think it means they have to pay for the wedding. Maybe I'll surprised them with a bill afterwards! Ha Ha! Actually, it's going to be a very simple wedding, so don't feel bad that no one's invited. We're just signing papers in the Santa Cruz courthouse. Maybe a nice Mexican seafood dinner on the wharf afterwards. We might plan a party later, and definitely will have a reception in Haiti once Andre is allowed to travel abroad, but for now this is all we have time for. The next day, on August 13, we have an appointment with The Immigration Project to fill out the application for permanent residency, we have to renew Andre's California ID, and update my health insurance because. For now we have two individual policies, which is twice the price that our joint insurance will be. Blue Cross goes by the age of the youngest spouse, so I lucked out there. Had I married someone my own age, our health insurance would have cost over $800 a month. Yikes! In our last days of unmarried life, Andre continues with his morning ESL classes while I alternate swimming laps MWF with Zumba dance classes on Tuesdays and Thursdays. Andre plays for the San Pablo soccer team and we both take martial arts class together. We also play racquetball a few days a week and bike along West Cliff whenever we can. The weather has been absolutely gorgeous most of the time since Andre arrived. He has no idea what winter in Santa Cruz will be like, but at least the transition has been easier for him in summer. 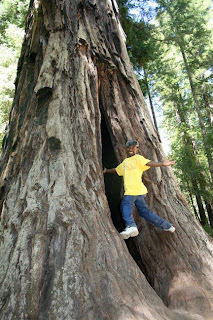 Recently we hiked in Big Basin up in the redwoods and checked out Capitola Beach. We made a second trip to San Francisco. We also have to get packed for our August 14 departure to Pittsburgh PA, Washington DC, New York and New Jersey. 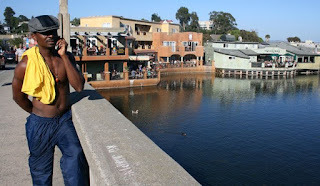 After a 3-week honeymoon, we return to Santa Cruz on Sept. 3 and settle down into married life. Someone pinch me!